I clearly had no idea what I was doing when I signed up to NaNoWriMo this year. 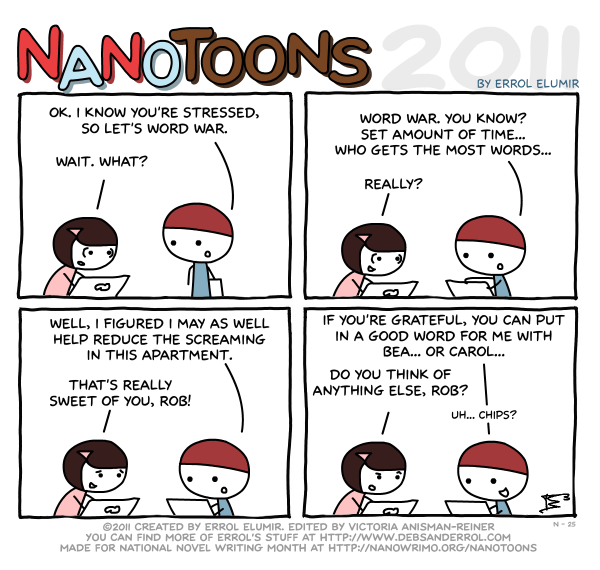 For those of you that don’t know NaNoWriMo stands for National Novel Writing Month and runs from 1-30 November. The goal is to write a 50,000-word novel in one month. In 2010 when I first participated, I wrote everyday. I remember it being really stressful but I had a novel on my head and I was stubborn. I got to 50,000 words by 28 Nov and that was that – I won! This year I’m struggling. It’s my second attempt. I put it off each year since 2010 and now I’ve jumped in. The problem is I’m meant to be at 18,000+ words by today and I’m only at 8,000+. At this rate, I won’t reach 50,000 words till the first week of Jan 2015! It’s a mess – and totally unlike me. I don’t write everyday, which is a major cause of the lack of progress. When I do write, I feel like I’m writing pages and pages but when I look at the word count, it says I’ve done only 123 words. What??! Anyway, I was hoping for some help. I have put to paragraphs here in the hopes that you will suggest how the story could go for a paragraph or two. “Why do you tolerate it, Mama? Why?” Gina felt her heart pounding and her hands shaking. She continued before her mother had a chance to respond, “He treats you so badly, Mama! I don’t understand…” Tears ran down Gina’s face. She had had enough. This was why she left home. “Gi, you will understand with time. Where we come from, women don’t just leave their husbands…” Her mother’s voice was gentle. “We women stay and fight.” She concluded. That was the day Gina swore never to marry anybody. She would rather die than live a life sentence. “Any time, Bea…you know I’m here any time,” Beth says as an unpleasant memory flashes through her mind. She reaches for her cup and finally sips her lukewarm latte. Everything is almost OK in the world. I am as stubborn as a bull! It was not that difficult when I got going, but I had several moments where I did not know what will happen next. It’s true when they say characters take a life of their own, I tell you. My story did not end the way I thought it would. I worried a lot about people’s names and places. I wonder how much that all matters but I can always go back to edit. There is still at least two more novels in me. I kept having to separate my thoughts as I was mixing up too many story lines. I had a plot and a subplot but at one point, my subplot was overpowering my main plot. My solution was to write it in a way that a sequel novel became inevitable (hehehe!). I am exhausted and looking forward to not writing much in December (sorry!). The winners of the blog contest will be announced on Sunday, 4 December. Thank you very, very much. Over and out! Bruno’s plans to propose to Julia get sidetracked by a hysterical Julia, after finding out that Joyce has left town and that Sandra and her family may be in danger. Julia finds out that Will is the witness to Paulie’s case. She had a dinner party with Bruno, Martha and Martha’s new beau, Ronan, who is ten years younger. Joyce comes home to find her apartment ransacked. Some papers on the floor indicate what it might be in relation to. She leaves for Manchester immediately to stay with her mum. Only 4 days and 6,500 words to go! Remember, ‘like’ up to 10 of these daily novel updates to enter my blog contest. See details here. Good luck ! Bruno gives an outstanding presentation that impresses Julia as well as other bosses at La Belle. Joyce goes for her 20-week scan and has mixed feelings about being a single mother. Meanwhile, Julia is persuaded to contact her.